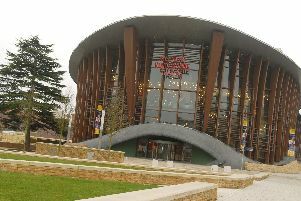 People can enjoy an intimate evening with the Only Fools and Horses actor John Challis at Aylesbury’s Waterside Theatre. Best known as Boycie in BBC1’s much loved sitcom Only Fools and Horses, he vists the venue’s second space on Saturday October 1. Having worked with some of the biggest names in show business, he’ll be spilling the beans about Only Fools and Horses co-stars like Sir David Jason and Nicholas Lyndhurst and friends and fellow performers like The Beatles, The Rolling Stones, Oliver Reed, George Best. He’ll also recall tales from his time on Doctor Who, Coronation Street, Benidorm and the recent Are You Being Served. The show celebrates the second volume of Challis’ autobiography, Being Boycie, and he will sign copies during the interval and after his performance during a meet’n’greet. Tickets cost from £18.98. To book call 0844 871 7607 or visit www.agtickets.co.uk/aylesbury.